Make this zucchini carpaccio salad when your summer squash is super fresh, as in, immediately from your garden or CSA box. Carpaccio, by definition, is an Italian non-vegetarian appetizer–thin shavings of raw beef drizzled with olive oil and lemon juice. This vegetarian interpretation uses thin shavings of impeccably fresh squash. Use the smaller squash, saving those biggies for something else. Cut your squash slices thinly, thin, thin, using a mandoline, or sharp knife. Not only can you use zucchini, but pattypan and yellow squash are perfect too. If you have more than one type, arrange the different varieties, and colors in concentric circles on the platter. If your summer squash is not super fresh–try this grilled zucchini and basil tart instead. Make it a fabulous week–get in the kitchen and cook something seasonal and delicious! Follow me on Facebook for daily vegetarian and healthy living ideas. *** If you make this recipe, please consider leaving a blog post comment. Your comments help other readers learn more about the recipe. Here's a fun vegetarian riff on the non-vegetarian classic Italian carpaccio. You can use any type of summer squash--in fact it's a very pretty presentation if you make concentric serving o 3 different varieties for 3 different colors. Slice the squash, whatever type, super thin. Makes about 4 servings. Cut the zucchini into paper-thin slices. Arrange slices, overlapping slightly, on a serving platter or 4 salad plates. Cut chiffonade slivers of basil leaves, and sprinkle over the zucchini. Drizzle the olive oil and lemon juice on top. Sprinkle with sea salt and pepper. Let stand about 10 minutes to soften the zucchini and let the flavors develop. Just before serving, sprinkle with the pine nuts and shaved cheese. If you have a squash blossom, garnish with slices of that. Do you feel as if you’re overwhelmed with greens? 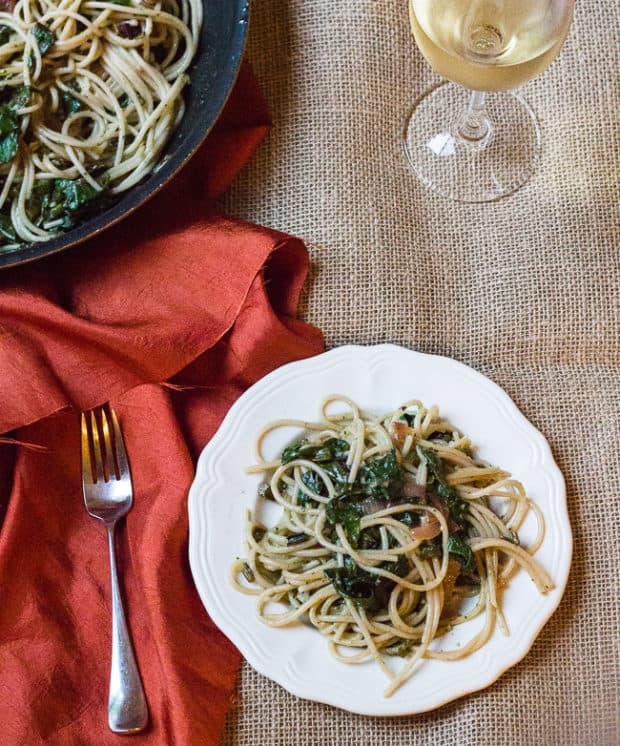 To use up greens in one meal, make spaghetti with beet greens, or pasta with any other greens you have on hand. You will love how what seems like a huge pile of greens shrinks incredibly into this easy quick dinner of spaghetti with beet greens! Creamy Italian rice, with tangy goat cheese, bitter-sweet spinach, and crunchy pecans– a wonderful vegetarian meal! Make this spinach and goat cheese risotto in the pressure cooker and dinner will be on the table in 20 minutes! Earlier this month we were camping on our land in Underwood Washington, which is just across the Columbia River from Hood River Oregon. A neighbor with a prolific garden gifted us radishes with vibrant and healthy leaves intact. I couldn’t just throw them away. So, we cooked up a pot of Red Lentil and Sweet Potato Curry with Radish Greens. I love how the greens complement the curry’s orange color. Today garlic scapes and summer savory from our CSA go in the pot, adding more green color and new flavor dimensions. Serve with plain yogurt and your favorite chutney, over steamed rice. The original recipe comes from Fresh Food Fast by Peter Berley. Thanks for stopping by. Get the latest recipe posts by email—subscribe here. Are you following me on Facebook, Instagram, and Pinterest? The cookbook link is an Amazon affiliate. When you purchase products via my links, it doesn’t cost you anything and I earn a tiny commission, which helps defray the costs of Letty’s Kitchen blog. Thank you for supporting Letty’s Kitchen. Heat the oil in a large saucepan over high flame. Add the onion and garlic scapes. Cook and stir until the onion softens, about 5 minutes. Add the sweet potato, ginger, garlic, curry powder, bay leaf and summer savory; cook and stir another few minutes. Pour in the hot water and the lentils. Reduce the heat to medium-low, cover and simmer until the lentils break down and the sweet potatoes are tender, 20 minutes or so. While the potatoes and lentils are cooking, wash the radish leaves and trim away the stems, then chop coarsely. Remove the bay leaf. Add the radish leaves about 5 minutes before serving. Season with salt and a pinch of cayenne pepper.